Every time I get the chance, I try to start my day with a smoothie bowl. It’s not only lovely looking and beautifully-colored, but also loaded with more nutrients than a normal smoothie. Although there aren’t too many fresh options available during winter, I always choose a vitamin C loaded fruit as the main ingredient, such as grapefruit or mango, then play with different toppings and flavors. Today I made my favorite combination: mango and coconut. It reminds me of holidays, while also nourishing my cells with exceptional nutrients. 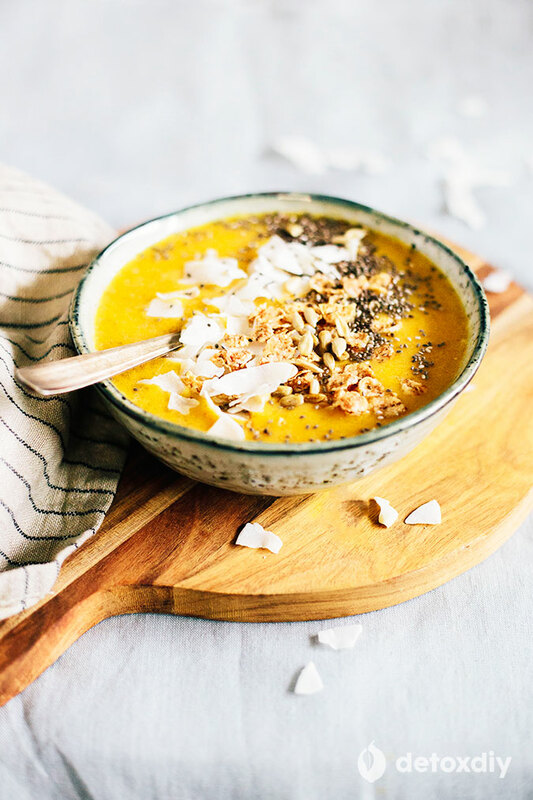 Deliciously flavored, creamy, and intensely yellow-colored, mango is an antioxidant superstar, and also a recommended winter detox ingredient. This fruit provides more than 100% of your recommended daily dose of vitamin C, the antioxidant necessary for supporting the immune system, as well as the production of collagen, responsible for slowing down the aging process. It also contains beta-carotene and polyphenols, offering antioxidant and anti-inflammatory protection for your cells against the damages caused by free radicals, and reducing the risk of chronic diseases such as cancer. Another advantage of eating mango is its dietary fiber content. Mango contains both soluble and insoluble fiber, supporting the natural detoxification process of your body. The fiber stimulates a smooth bowel movement and reduces the amount of time the food stays in your colon, while also reducing the cholesterol by eliminating excess along with toxins and unneeded estrogen. Mango is the fruit to choose for giving your body a good cleanse, since it nourishes your cells with detoxifying phytonutrients and helps them restore themselves, while also supporting the immune system function. A better absorption of beta-carotene antioxidants is always supported by consuming them alongside a healthy fat source. This is why the combination of mango and coconut is not only delicious, but also a beneficial one for your body. Play with the toppings any way you like. I added chia seeds for extra fiber and a good dose of magnesium, and oat flakes for a crunchy texture. Add all the ingredients into a blender and process to obtain a smooth, thick liquid. Add the sweetener and pulse to incorporate. 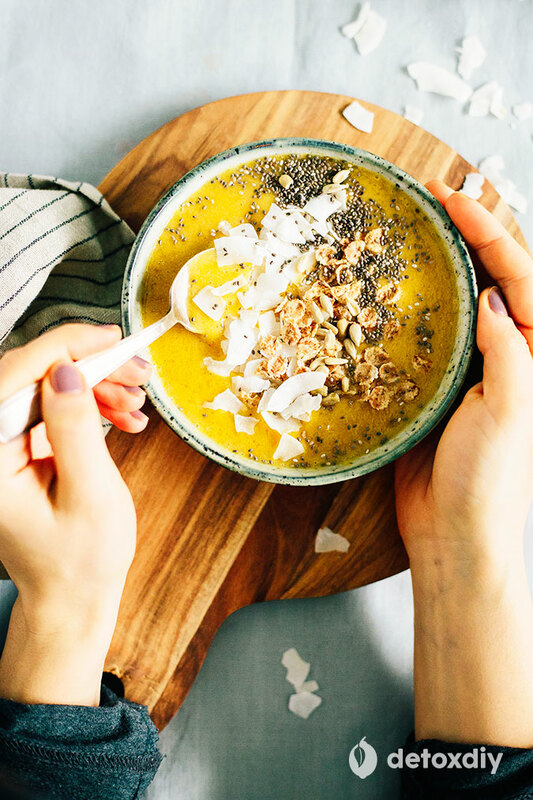 Pour evenly into serving bowls, top with chia seeds, coconut and oat flakes, and serve. 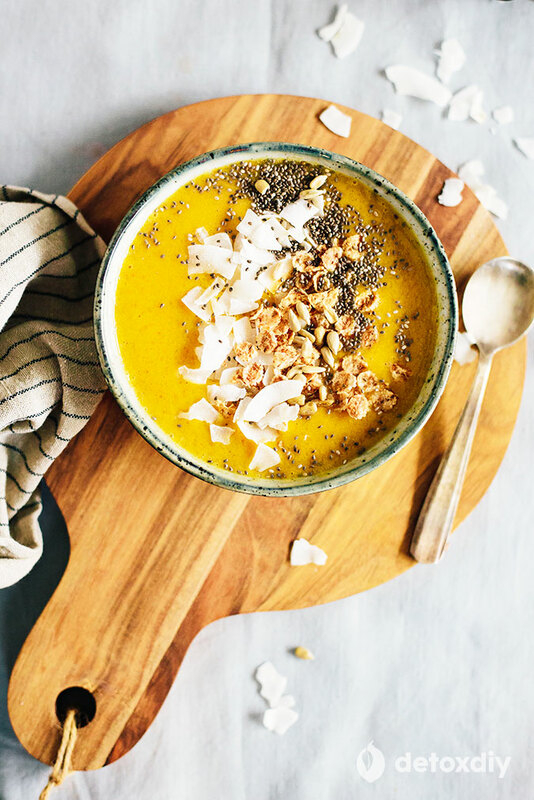 The consistency of this recipe was perfect for the smoothie bowl. However, for me, I tasted the turmeric too much. So I added coconut milk and a banana and it became a delicious, creamy smoothie. This sounds so good! I love a good smoothie bowl!